Health apps can help patients take charge of their health, says the American Heart Association, which also suports the EKG app. The new Apple Watch unveiled Wednesday has a new, real-life medical app: a heart monitor. The watch has two electrocardiogram, or EKG, apps that are approved by the Food and Drug Administration and supported by the American Heart Association. They are designed to catch irregular heart rhythms that may not necessarily show up during a medical exam but that can signal serious heart risks. The phone also has a function that detects if the wearer has fallen down and hasn’t moved for a while, and can call for help. Companies have been working for years to come up with wearable digital health products to tap into an aging, health-conscious and well-heeled population. 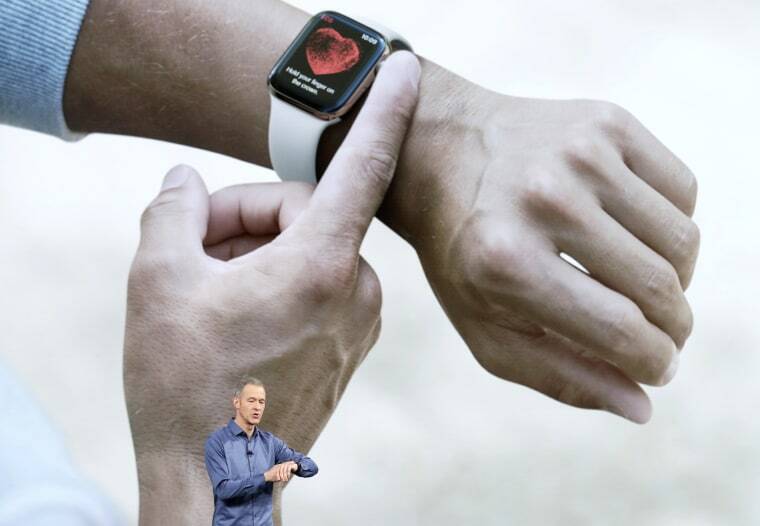 "The Apple Watch has become an intelligent guardian for your health," Apple chief operating officer Jeff Williams said at a news conference at the company's headquarters in Cupertino, California. Many fitness trackers and smart watches have heart monitors, but their accuracy varies, and simple heart rate does not always convey much useful medical information. The two FDA-approved Apple apps monitor for atrial fibrillation, a common heart rhythm irregularity that can lead to stroke. They can also detect unusually slow or unusually fast heart rates and record the data for a medical professional. The apps will not work like an office-based EKG, which is conducted with usually a dozen electrodes scattered over the chest to detect and analyze the heart’s electrical signals. "This will be, from what I see, a rhythm recording device," American College of Cardiology president Dr. Michael Valentine told NBC News. "But I would caution people who think you could determine other cardiac problems such as heart attacks from a wrist recorder." Nonetheless, Valentine and other heart experts said the device had the potential to gather useful information for patients and their doctors. Apple worked with the FDA to design a wrist-based monitor that would gather enough meaningful information about heart rhythm, and present it in a way that might be useful to a health professional. “In my experience, people often report symptoms that are absent during their medical visits,” Ivor Benjamin, president of the American Heart Association, said at the event unveiling the $399 watch. “The ability to access health data from an on-demand electrocardiogram or ECG is game-changing, especially when evaluating atrial fibrillation — an irregular and often rapid heart rate that can increase a person’s risk of stroke, heart failure and other heart-related complications,” Benjamin said. That is true, said Valentine. Such a device could help doctors treat patients who report dizziness or heart palpitations, both potential signs of heart rhythm disturbances, said Dr. Lawrence Phillips, a cardiologist and assistant professor of medicine at New York University Langone Health. FDA commissioner Dr. Scott Gottlieb said he wanted to encourage companies such as Apple to design medical devices that can help everyday people. “Health care products on ubiquitous devices, like smart watches, may help users seek treatment earlier and will truly empower them with more information about their health,” Gottlieb said in a statement. The apps are not meant to substitute for physician visits, but can gather data that might help doctors more than simple patient reports of a fluttering heart rate or breathlessness. “The role that technology plays in allowing patients to capture meaningful data about what’s happening with their heart, right when it’s happening, like the functionality of an on-demand ECG, could be significant in new clinical care models and shared decision making between people and their health care providers,” said Heart Association CEO Nancy Brown. Phillips stressed that patients should not think that they can use a heart monitoring app without a physician's input. "This technology does not replace seeing your doctor if you have symptoms," he said. "The devices are not meant to give you reassurance that you don't need further evaluation."